5 Enterprise IT Solutions We're Loving! Tomorrow is Valentine’s Day and while most of us are planning a special day with our special someone, here at LookingPoint we are thinking more about the technologies we are loving most this year! We want to share the love with our customers and blog subscribers, so we’re sharing the love with this list of the 5 enterprise technologies you are bound to fall in love with this year (if you haven’t already)! Cohesity is the industry-leading platform for hyperconverged secondary storage solutions. Data powers modern business and it is becoming more difficult to effectively manage your data as it continues to grow exponentially. Most companies have siloed their storage and backup solutions and are battling to manage all the different solutions. With Cohesity you can consolidate all your secondary storage on a single web-scale platform. The platform provides end-to-end encryption for efficient data protection for your physical, virtual and cloud environments. Make your data work for you with tailored insight and analytics. Managing your data storage and backup from a software-defined platform gives the cost advantage and flexibility to scale out storage. What we love most about Cohesity is the single, easy to use platform for both backup and storage. Today’s workforce is becoming more mobile and more business-critical applications are running over the internet and across multiple cloud environments. SD-WAN simplifies WAN management and connects enterprise networks, providing aggregation of WAN bandwidth, centralized control and policy enforcement, and visibility into network traffic. Cisco SD-WAN is a cloud-first architecture, separating data and control planes. With Cisco SD-WAN you can quickly and easily establish an SD-WAN overlay fabric to connect data centers, branches, campuses, and co-location facilities. What we love most about the Cisco Viptela SD-WAN solution is the ease of deployment, scalability, complete visibility into your environment and cloud application enablement. LogicMonitor is a SaaS-based monitoring platform for Enterprise IT that provides simplified monitoring and analytics for on-premise, cloud and hybrid data centers from a single platform. Using a SaaS-based architecture, LogicMonitor easily fits into any existing environment with very little configuration required. To get all the performance metrics you need to keep your infrastructure running smoothly all you need to do is deploy the Collector, which will automatically recognize the devices in your infrastructure. From a single platform you can get alerting, correlations, custom dashboards, forecasting and reporting for your cloud environments, IT infrastructure and integrations/ applications. We love the easy of deployment and full visibility into complex, hybrid infrastructures that LogicMonitor offers! The way people work is changing, and more and more companies are allowing employees to work remotely, and access the company’s secure network from personal computers and smartphones. Data has also been migrating inside a company’s data center to public clouds and with this migration comes an ease of accessing data from any device, anywhere. This increased accessibility makes it more important than ever to ensure that the person accessing your data really is who they say they are. Two-factor authentication provides an additional layer of security, in the form of something you physically have, to be able to log into the system. Duo Security is a cloud based two-factor authentication solution you can get up and running in just a few minutes. The Duo Push two-factor authentication method is one of the easiest methods of authentication, pushing an automatic notification to the device I physically have for credential verification when you log into your applications. From that device, simply click the “Approve” push notification, and you are instantly logged into the application. The ease of using Duo is what has us loving this 2FA solution! The digital credentials we use every day to connect to our critical business applications and online services, such as our usernames and passwords, are among the most valuable assets circling the Dark Web. Dark Web ID is the first commercial solution designed to detect compromised credentials on the Dark Web in real-time. 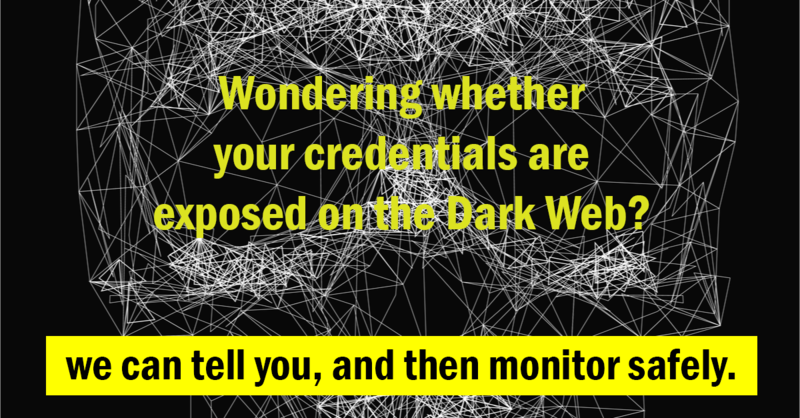 Dark Web ID provides 24/7/365 searching, monitoring, and reporting for compromised credentials associated with your company on the Dark Web before critical assets are compromised, used for identity theft, data breaches or other cyber crimes. Coupling Dark Web ID with a layered security approach, we can help your organization reduce the likelihood of compromised credentials and the impact on your organization should your credential be compromised. What we love most about Dark Web ID is the advanced security visibility, threat prevention, and identification and altering of potential threats! If you're looking to show some love this year to your IT team and your infrastructure, any of these solutions are guaranteed to be a hit!